Beaten and wounded by a band of sadistic renegades that rules the borderlands of Indian Territory, U.S. Marshal Kaed Turner understands what the inevitable outcome will be for him: death. But Fate and a war party of Choctaw Indians intervene, delivering him instead to a beautiful angel with the skill to heal him. Jessica Monroe has already lost a husband and a brother to the outlaws who tortured Marshal Turner. As the rugged lawman lies bleeding on her bed, she faces a difficult decision. Can she afford to gamble with her heart one last time? For when Kaed recovers, he is sworn to join the other Territorial Peace Officers in their battle to wipe out the renegade gang once and for all. When vengeance is done, will Kaed keep riding? 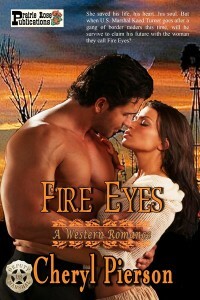 Or will he return to claim his future with the beautiful woman the Choctaw call "Fire Eyes?"